Mayor Pete Buttigieg's flagship housing redevelopment plan for South Bend, Ind., has attracted much praise for its ambition—but some of the city's black and Hispanic members worry that Buttigieg's program has overlooked their communities. Buttigieg set a goal to rebuild or replace 1,000 dilapidated houses in South Bend in 1,000 days (a period of about five years) based on the Vacant & Abandoned Properties Task Force Report conducted by his administration from 2012-2013. Within this report, Buttigieg laid out what would become the credo of his mayorship: "data-driven decision-making." This approach evaluated properties based on assessing "the physical condition of the structure, the financial resources of the property’s owner, and the strength of the neighborhood real estate market." Depending on the judgement by inspectors of the homes and the neighborhood, Buttigieg's administration would decide whether to instruct owners to either rebuild or demolish the structures on their properties. In his letter introducing the report, Buttigieg praised his administration for crafting a plan that would put South Bend on track for revitalization by reducing the number of vacant homes in poor neighborhoods. "Based on this work, they were able to create a much more sophisticated view of the dimensions of our abandoned property problem than we have ever had before," Buttigieg wrote. "Thanks to their work, instead of flying nearly blind, we now have a deep and rich body of data to guide policy decisions going into the future." When Buttigieg presented the report to the city in an open meeting, city resident Joseph Shabaz accused him of trying to gentrify certain neighborhoods, saying that similar plans have been used to force poor people out of low-income neighborhoods and "change the neighborhood completely." 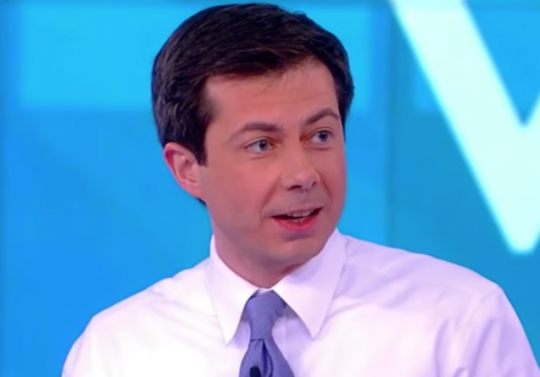 Buttigieg replied saying his data-collection process ensured that only vacant houses would be tagged for demolition or repair, and the city would not forcibly move anyone. "So residents living nearby, I hope, we'll see their prosperity grow," he said. After Buttigieg finished speaking, Shabaz stormed out of the room, muttering, "You should be ashamed of yourself," according to the South Bend Tribune. The program's rapid roll-out soon stirred discontent among minority communities, whose neighborhoods saw the most demolitions. When the city began the program, it fined homeowners who did not keep their houses up to code and often forced them to pay for demolition if the home was deemed beyond repair, according to the Indy Star. South Bend Common Council member Regina Williams-Preston recalled to how she was unable to keep up with the city's rapid demolition agenda. "Homes were coming down blocks at a time," she told the Star. "Dust was in the air, and people were wondering what is going on, and why are we just tearing down homes. They'll [the city] say they were targeting vacant homes, but they didn't really understand the community." After Williams-Preston and her husband lost three homes that they planned to flip, she ran for Common Council to protect the interests of blacks in South Bend. After winning her seat, Williams-Preston said that she was able to convince Buttigieg to create a $2 million program for home repairs and an additional $2 million to aid with affordable housing. "I think it's really a mark of a true leader to hear that maybe ‘I'm doing something wrong' because, quite frankly, there were a lot of mistakes made," she said. Williams-Preston is running to replace Buttigieg as mayor. As the 1,000 homes in 1,000 days project progressed, Buttigieg also embraced the nearby University of Notre Dame, pairing the city with the college for more development projects. But some local residents feared that the rapid expansions were gentrifying historically black neighborhoods. During a 2014 meeting at the Notre Dame, Northeast Neighborhood Revitalization Organization board member Marguerite Taylor said that the neighborhood she grew up in was mostly black. It has since been gentrified she said, and is now almost 100 percent white, according to the Tribune. During the panel's question and answer section, one woman in the back of the room called out: "Why are we okay with a whole neighborhood of white folks with one black person and one Hispanic person?" By 2015, Buttigieg reached—and surpassed—his goal, 1,122 properties addressed. About 60 percent of the houses were demolished and about 40 percent were fixed, according to a report from the city. But at the same time, community leaders feared that the plan had moved too quickly—and had altered the character of South Bend. The touchiness about gentrification became apparent when South Bend Cubs owner and local investor Andrew Berlin bragged that he had signed a 20-year lease with the city, committed to "gentrify" South Bend. "The deal I made with the mayor at that time is that we would do anything in our power to help South Bend. Help South Bend gentrify, bring people to live downtown. Moreover to help the residents and to encourage developers and to be encouraged to develop themselves," he said, according to ABC 57. The comment drew criticism from Common Council, and Council member Oliver Davis responded in a statement. "Please respectfully know that it is clearly hoped of me and many others who live here in South Bend that with all of the great investment which Mr. Berlin has graciously done and will continue to do for our City of South Bend that gentrification, which is the process of changing a neighborhood so that the people who had lived there for many years can no longer afford it, will not be a part of the ‘game plan' for the City of South Bend for the next 20 years," he wrote. Berlin later clarified that by gentrification, he was referring to "taking empty lots and blighted lots and developing them," as Buttigieg had outlined in his housing plan. Buttigieg's "data-driven" approach to governance has come under fire before. In 2018, he drew ire from local religious leaders when he vetoed a rezoning measure that would allow a pro-life health center open next door to a proposed abortion center. Additionally, Buttigieg has been criticized for the way in which he demoted former South Bend police chief Darryl Boykins, the city's first black man to hold the position. Buttigieg has called the incident his "first serious mistake." This entry was posted in Politics and tagged 2020 Election, Notre Dame, Pete Buttigieg. Bookmark the permalink.